It’s autumn. Time for comfy sweaters, pumpkin-flavored everything and… vacation? For backyard chickens across the country, shorter days often signal time for a break. Birds may stop laying eggs, lose old feathers and grow new ones. This annual vacation from egg laying is called molt. The onset and length of molt looks different for each bird. How long chickens molt for depends on factors such as age, consumed nutrients and the environment. You’ll often first notice that feathers are losing their sheen. 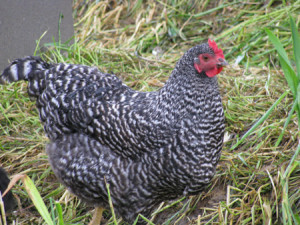 Hens may then gradually lose a few feathers or it could happen overnight. We’ve noticed that more productive egg-layers and younger hens recover from molt more quickly than older or less productive hens. In any case, proper nutrients and management can help birds through molt. Pack the protein Just like humans, birds need a different diet depending on their current activity or life stage. Protein is the key nutrient to pack in a flock’s diet during molt. The number one nutrient switches from calcium to protein during molt. This is because feathers are made of 80-85 percent protein, whereas eggshells are primarily calcium. When you notice your chickens losing feathers, switch to a complete feed that’s 20 percent protein and includes probiotics, prebiotics and key vitamins and minerals. Purina® Flock Raiser® chicken feed is a key option. A high-protein complete feed can help hens channel nutrients into feather regrowth and get back to laying eggs. For organic flocks, try switching hens to Purina® Organic Starter-Grower when molting begins in order to maintain organic status and provide a higher level of nutrition they need for feather regrowth. While on vacation, people generally want plenty of comfort and room to relax. It isn’t so different inside the coop during molt. Keep molting chickens comfortable by preventing stress.During molt, the area where the feather shaft meets the skin can be very sensitive, so reduce handling and provide plenty of clean bedding. Offer enough space for your birds to rest and relax in private. For each bird, four square feet inside the coop and 10 square feet outside of the coop can keep them comfortable. In addition, provide access to plenty of fresh, clean water and proper air ventilation. Hydration and ventilation can help keep the backyard coop spa-like for feather regrowth. Avoid introducing new flock members during this time, as adding in new friends and potentially re-shuffling the pecking order could add stress. This entry was posted on Monday, November 7th, 2016 at 11:06 pm	and is filed under Uncategorized. You can follow any responses to this entry through the RSS 2.0 feed. Both comments and pings are currently closed.